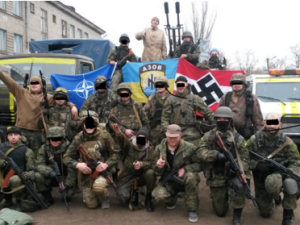 The American support of contemporary Ukrainian fascism albeit shocking is in fact not a new political phenomenon. Documents declassified by the CIA under a FOIA request entitled The NAZI War Crimes Declassification Act show that not only was the CIA monitoring Ukrainian fascist groups during and after WWII, it was also actively aiding them and protecting them from prosecution. These and other documents can be found in the CIA’s Freedom of Information Act Electronic Reading Room. The following documents are but a few of the many that pertain to America’s protection of war criminals the world over. Stepan Bandera, who was the leader of the OUN (Organisation of Ukrainian Nationalists), is a man revered by the current Ukrainian authorities and seen by the fascist Ukrainian battalions as a national hero. Both western politicians and the mainstream media have worked hard to obscure his role in Ukraine’s history of ultra-nationalist and fascist movements. He was, in fact, a ruthless mass murderer whose wartime atrocities can only be viewed as crimes against humanity. With his wholesale rehabilitation in Ukraine, the anti-fascist opposition has taken to calling his supporters ‘Banderites’ and their actions ‘Banderism’. Stepan Bandera’s legacy not only benefits from the ignorance engendered by today’s corporate media and politicians; he also, from the years of the Second World War up until his death, personally benefited from the aid of the American government. Not only was he protected from the justice of the Soviet Union but he also enjoyed the ability to ask for Washington’s help in such matters as obtaining visas and secret accommodation.